THE SIKH NUGGET: Nihang Singhs: The educational wisdom of the warriors. Nihang Singhs: The educational wisdom of the warriors. Nihang Sikhs, who sport electric blue dresses, soaring turbans and daggers, knives and swords, are known for their amazing Sikh martial art skills (gatka), horsemanship and swordsmanship. But even in this close-knit community, there are those who have seen the value of education and have attained a university or college degree. They are now making their mark in various fields, while maintaining a deep bond with their community. Charandeep Singh meets several members of the Nihang community who are pro-education. 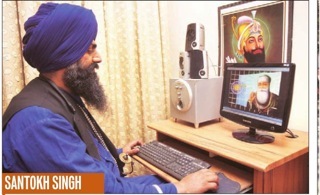 Valuable lessons After pursuing his own education, Capt Varinderjit Singh Dhillon, realised the importance of educating the next generation of Nihang Sikhs. He now works as a schoolteacher of moral science and Punjabi at Budha Dal Public School in Zirakpur. “Education is the essence of life. I witnessed a huge change in my personality after I completed my graduation. 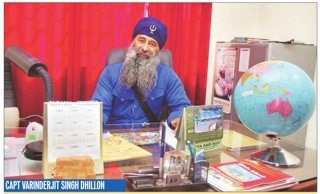 Now, I want every child in my small Nihang Sikh community to be educated,“ asserts Dhillon, 51, who served in the Indian Army before taking up teaching. He is close to his community and acts as the community's “chief liaison officer“, at various government offices. “I can easily interact with government officers since I worked for the government in the past and am quite familiar with the processes,“ he explains. “This has only been possible after receiving my formal education,“ he adds. Dhillon graduated from the Army College, Siliguri, after doing his schooling in Anandpur Sahib. He is also the editor of monthly magazine Nihang Singh Sandesh. Dhillon's daughter is following in her father's footsteps and is currently pursuing a Bachelor of Pharmacy. “I would love to send her abroad for further studies. She will be the first member of our family to study overseas,“ says the proud father. Besides teaching and dreaming of educating his kids on foreign shores, Dhillon is also a fitness freak and regularly goes on long walks or jogs. He is fond of sports and spends his spare time watching sports channels or driving his SUV. “My educational background and my fluency in English have made me a star in the Nihang Sikh community,“ he beams. At just 25, Simranjeet Singh is an international roller-skating champion and runs his own documentation centre in Patiala. He attended public school in Patiala and then did his graduation in fine arts from Govt Mohindra College, Patiala. “My parents have always been a huge support and even encouraged me to study further,“ he says. Singh even went to work in Italy for a year. “My education as well as my exposure abroad has made me a prominent member of my community and has given me a special place among the Nihang Sikhs,“ he says. Singh also performs gatka at various nagar kirtans (neighbourhood kirtan) all over Punjab. “I enjoy training youngsters in shastar vidya as only Nihang Sikhs practice this art. Had it not been for us, this tradition would have vanished. 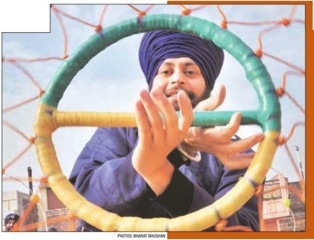 My expertise lies in handling traditional Sikh weapons like malatthi, daang, soti and chakkar,“ he shares. Also a philanthropist, Singh frequently donates money to underprivileged girls for their marriages and he also provides food and shelter to the needy. SANTOKH SINGH Hard work pays off For Santokh Singh's family, education comes first. “My grandfather was a tehsildar (revenue officer) and my brother is an inspector in the police force. 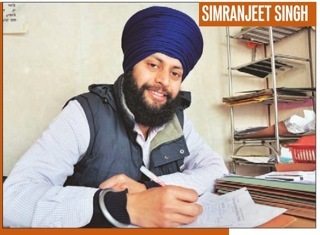 So, for me to pursue an education was absolutely essential,“ says Singh, 40, who studied humanities at Patel Memorial National College, Rajpura (affiliated to Punjabi University, Patiala). A Rajpurabased farmer, Singh spends ample time helping his children study. His daughter is pursuing her BCA and his son, who is still in school, is on Punjab's Under 16 cricket team. “I love tutoring my children and I always make it a point to sit with them while they study,“ he says. Always armed with two kirpan's and a daang, Singh calls himself a true Nihang Sikh. 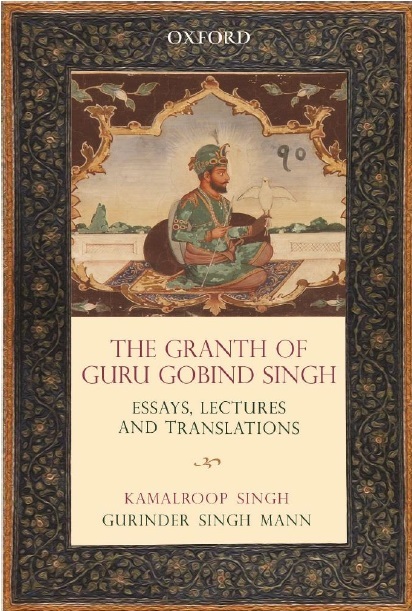 He has never travelled abroad and feels that Punjab -“the land of Gurus“ -is heaven on earth. “I strongly feel that a higher education is enlightening. It has expanded my horizons and increased my understanding of the world,“ says Singh, who contributes to a monthly publication for Nihang Sikhs called Patrika Vihaar. Singh, who enjoys watching the Discovery channel, is an avid reader who has read almost all of Osho's books. He is also a fan of Punjabi literature, his favourite novel being Marhi Da Diva. “I have received so much respect due to my educational background. I was a good student and worked very hard as I always wanted to achieve something in life,“ he says. 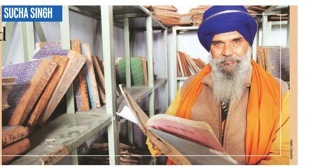 SUCHA SINGH The write way forward Fifty-two-year-old Sucha Singh started off as a teacher of Punjabi language at government schools until he was promoted and now works at the headquarters of the Punjab School Education Board. Hailing from an underprivileged background, he ended up doing his graduation in political science and history through correspondence. “My father always encouraged me to study, but we were very poor. I wanted to be an advocate and ended up paying R13,000 to do my LLB at Bhopal University but I had to drop out due to our financial situation,“ he shares. But with Singh's determination, he succeeded anyway. He has written a book in Punjabi called Bajwe Dian Arshi Lehran (a collection of poems and short stories) and is working on his second book, which is a tribute to God. “Education has made me a better human being and has given me a privileged life, which wouldn't have been possible without formal education,“ says Rajpura-based Singh, who spends his spare time meditating. Singh has three sons, and his eldest son has done his BCA. “Nowadays, there's so much competition and it's difficult to get a job. Kids need to have that edge over others if he or she wants to survive -there is no scope for mediocrity,“ reflects Singh. I thought Nihangs got rid of their caste names on taking amrit? What happened with Capt Varinderjit Singh Dhillon then? You also might want to stop referring to the Sikh Martial Art as Gatka...this British inspired watered down jumpa round with a stick circus act is NOT the Sikh martial art. Refer to the correct term of Shastar Vidiya, the traditional battlefield art of the Sikhs.